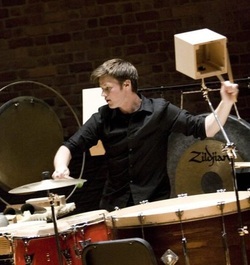 Ryan Nestor (1985) is currently a candidate for the Doctorate in Contemporary Music Performance at the University of California, San Diego, where he is a member of the percussion group red fish blue fish. Nestor was the Music Director at The Old Globe Theater Company during its production of Othello, and was previously the timpanist of the La Jolla Symphony. Nestor has performed at the Cervantino Music Festival, The Ojai Music Festival, Monday Evening Concerts, The Wulf, Moore Theater, and Bang on a Can Marathon. Nestor is a teaching assistant at UCSD and was an adjunct lecturer in music at Queensborough Community College. Nestor earned his Master’s degree in Percussion Performance at Stony Brook University and his Bachelor’s degree in Music Education from the University of Kentucky.